We plan for a short day today. Betsy's shin is swollen and painful and although improved this morning will not stand a full 30km. 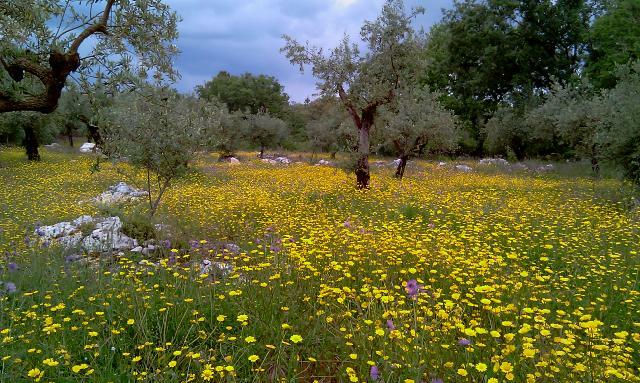 The morning is bright and cool and we are walking through a limestone area of olives and flowers. Our path is mainly on small side roads with the very occasional vehicle. Buildings are again a mix of abandoned and used but with some very nice looking new builds. It is good to see the traditional wall tiles found mainly in blue and white being put up on new homes. Strangely some of the houses in Alvaiazere are in an Art Noupveau style probably built in 40s. A bit odd in such a rural town. We wander up and down the little lanes rain threatens we put on waterproofs it changes its mind. Still a 30% chance of precipitation, maybe this means we get wet one day in three. even so Betsy is limping, her shin splints have flared up it may be alternative transport for her for a couple of days to see if rest will do the trick. A fine afternoon so washing of clothes the order of the day. Breakfast is included so no need for a coffee stop for miles. Just as well, this is a day of ridges and bridges. At least at the beginning. We cross the bridge over the Rio Nabao in Tomar and head uphill out of town, shortly we cross another very old bridge and then go under a much more modern one with a main road on it. We walk a long way along a straight ridge before a lot more serious up and down. Never very much but sometimes quite steep. 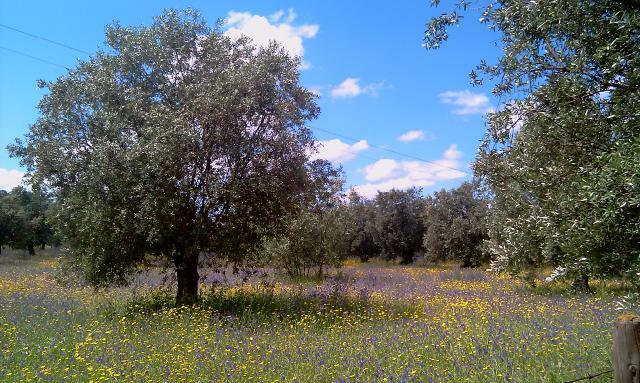 This is rural portugal and full of olive trees, figs and citrus fruits bit not a lot of cafes or bars. A lot of houses are abandoned, and some obviously only a part is still inhabited. In one area the chimneys look like little hexagonal minarets. Once again it starts to rain (what does a 30% chance of rain mean anyway?) and we descend down a near stream with some miserable goats and even more miserable looking sheep. These sheep were not about to move they had a bit of dry ground under them and intended to keep it that way. By this time we had covered about 20km and Betsy was struggling a bit, shin pains on one side were giving problems coupled with a poor nights sleep meant a slower pace for all as we failed to find the correct route but came into Avaiazere along the road, fortunately not too busy, another 30km day. Leaving Betsy to recover Tony & Tim wander round the village/town, the tourist office is still open, a little hexagonal bandstand in front of the church. The lady in there plies us with information and delves into filing cabinents for English translations, we suspect we are her work for the day. We are now at around 300m in an area of limestone with karst formations, which explains the orchids at the roadside reminiscent of the Derbyshire White Peak. We rise and are given a farewell coffee by the ample portuguese owner. The day is forecast to be fine but is at this hour attractively misty. We pass the old royal summer palace at Quinta Cardiga in a sad state of dilapidation. We are unsure of the length of the walk today as our two guide books differ substantially and one admits to becoming lost twice in eucalyptus forest. The day clears and although rain threatens it never actually happens. We negociate the forests in fine style GPS combined with 50year old maps sourced off the internet by Tony plus occasional yellow arrows (not a lot to put them on in fairness) see us through. We have left the flat plains of the Tagus and although the hills are not high we notch up 1000m of up and down according to the GPS (we suspect it of exaggeration). A good lunch in the backroom of a bar at 20??? for the three of us including a litre of red wine and coffees is the best deal we've had yet. Menu options selected included rabbit, fish and a veal stew. Not a good bird day only one stork though the charms of goldfinches are worthy of note being duskier than ours at home. We march into Tomar in fine style stopping briefly at a 14thC remainder of a little church and have no difficulty locating the recommended lodging and get a room for the three of us for 45 euros, including breakfast. No need for a supermercado today! We discover that we have missed a Grand Festival of soup by one day, what a pity! We also miss a chance to visit the Templar castle for after showers and recovery we climb the steep cobbled ascent to it to find it closing, the gates are shut on us with a truly medieval crash and locked with a key worthy of the Bastille in its heyday. Santarem that we stayed in last night is a walled town on a hill overlooking the Tagus. Obviously a town of importance and a medieval seat of local government. It was the home of Pedro Alvares Cabral the discoverer of Brasil for Portugal, this providing later a refuge from Napoleon for the Portugese monarchy. Early in the morning we hear the rain and are fully rigged for the wet on leaving our comfortable lodgings. It is not raining but starts hosing down within a minute or two. By the time we reach the park of the gates of the sun with views of our route to the north it has stopped so we seize the opportunity to have breakfast before starting our perilous descent down a wet overgrown path beneath the town walls. There are yellow arrows so at least one idiot has passed this way before. The route goes then over vineyards and fields along some muddy tracks with more rain falling. The weather gradually clears and eventually we reach Azinhaga having startled a few storks who were fishing or whatever storks do, by some ponds we passed. During the day we are overflown by many storks, we saw hardly any in flight in august two years ago, only in their nests. By the time we reach Azinhaga a village not far from Golega (the equestrian capital of portugal) we are very muddy but none the less welcomed in by the owner of a restaurant off the main street. It was not obvious except for a sign saying open (but not what was open) we peeped in and were retreating again when he appeared and dragged us inside for some excellent roast duck. Other birds spotted during the day include a red kite, a purple heron and just opposite the restaurant a whole row of swallow residences full of young with parents busy feeding them. The final 5km passed quickly and painlessly except for Tony getting caught up in Betsy's walking pole, and passing a grove of olive trees with purple and yellow flowers littering the ground around the old trees. On arrival at the campsite in Golega we find chalets available at 96 euros per night, the bombeiros are looking attractive but we find a large room with 5 beds above a cafe that seems used to pilgrims at 15euros each, we then get talked into another meal with promises of pork in red wine with more to go with it. The portugese do like their food. The weather forecast today is for rain, we start at 0730 and have breakfast in the town picnic site. (orange juice and cake purchased yesterday). Our route then zig zags across the fertile alluvial plain of the Tagus including a section on a well preservrd Roman road until we encounter a large earth bank and a road running north. The GPS informs us the river is on the other side of it, it is a levee protecting the fields and homes from the annual floods. We walk along a track largely following the levee past fields with egrets and large acreages of newly planted tomatoes. It starts to rain not very hard but quite persistantly. This continues most of the day with occasional short breaks. We are over flown by a black kite who looks wet too. There are two welcome breaks for coffee but we trudge on through the fields past large horse ranches getting a look in the distance at the machine that plants seedling tomatoes and lays irrigation pipeing at the same time, Betsy is impressed. we pass a marker post showing the height of previous floods. february 1979 deemed to be the highest at 1.9m. All good things must end and eventually by half past two after 30km we reach Omnios a little village at the foot of the hill up to Santarem. We enter the Restaurant Forcado.concerned we may be too late to eat, we are tired, wet and hungry the last of these is rapidly sorted by the very friendly mother and son already serving a collection of locals. 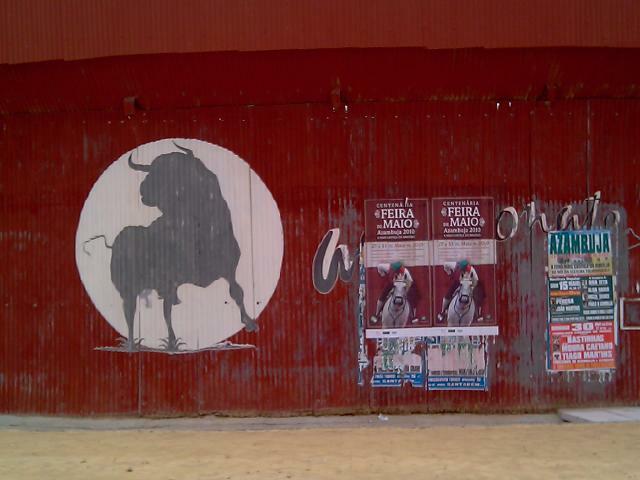 there is a large bulls head attached to the wall with bull fighting memorabilia on every available surface. We get bread, olives and cheese as starters with a litre of local red wine, and a mixed grill with enough meat for six plus salad and rice and beans and then coffee for thirty euros for the three of us. We now don't care about the hill but it takes over an hour to find a room. Availability is a problem perhaps things will improve when we leave the route to Fatima tomorrow. A day of chaves, chuva, romans and darts. Betsy once again a source of great mirth when trying to break and enter the ladies without first requesting the chave - key, then at the next coffee stop becoming a target for the local darts players. Many comments along the way from locals about the unpleasant chuva - rain. A night in the Pension Ribatejo next to the station, unfortunately! Off in the morning for a days walk through more industrial estates and some fields, almost completely on tarmac and much beside main roads but with reasonably large verges. One benefit of the industrial estates was the many little bars and restaurants, so a cheap supply of coffee was readily available. Once again the day was saved by the wild flowers in bloom along the roadsides. 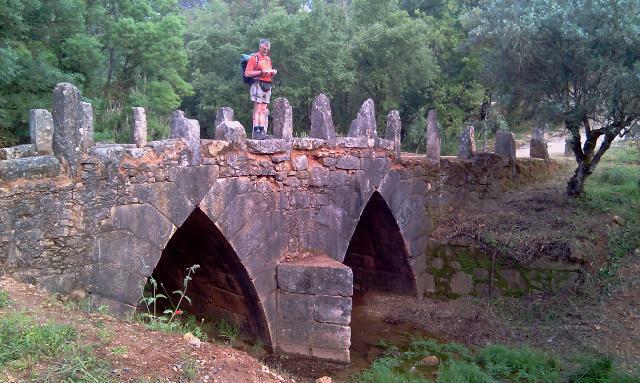 After only four and a half hours we reach Azambuja 19km from Villa Franca up the bank of the Tagus. Tony has a bolha (portugese for a blister) and Betsy's hips are currently sustained by Voltarol, only Tim so far escapes. 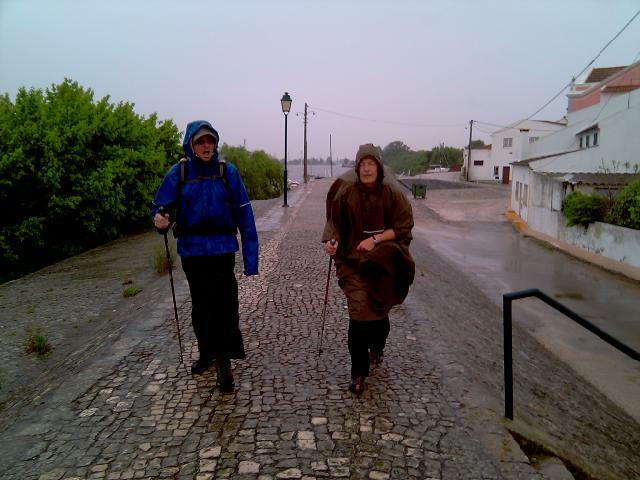 We have seen several pilgrims on the route all heading for Fatima the main portugese pilgrimage, and due for a papal visit in four days time. We think this best avoided and our way will part from the Fatima route after tomorrow. They are all in hi vis jackets and are bused back home to Lisbon each day to start again, no this is not some promethean endurance test, simply an organised Catholic church helping its members to flock to Fatima. Azambuja has a corrida similar to that in Pamplona but in 3 weeks time, they are already putting up the barriers to keep the bulls safe! It also has a restaurant that does an excellent pasta and seafood stew. We found this by accident it had just started to rain. Another first for the day are the nesting storks, Betsy has not seen these before as they had just flown off in september two years ago. As before they are not only on church towers but radio masts and other high man made structures. We are in a room for three in a pension again, the bombeiros still await in case of need. We rise early again to get a taxi to the airport and see Jane checked in for her flight back to Bristol. 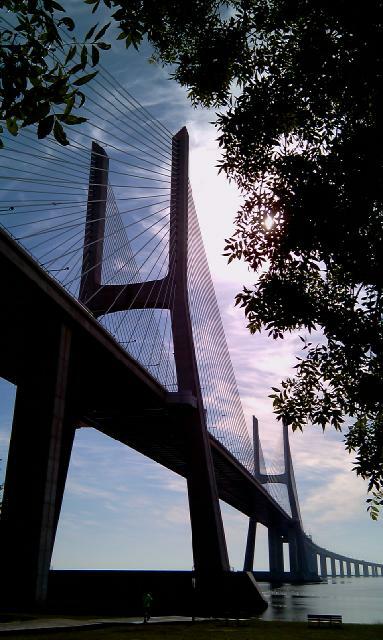 We three then get another taxi out to the Vasco da Gama tower and bridge over the Tagus. The driver seemed a bit upset to some of the party, others failed to notice. We start walking and after a while the route heads inland to avoid a climb up to an unpreposessing suburb. We pass up a riverside covered in flowers, another time of year it could be unpleasant but it is a delight, with flights of Black winged Stilts swooping about. We loop round and rejoin the river, to our chagrin the VdG bridge appears only a mile or so downstream, we have walked about 6. We have a beer and an omlette sandwich! for lunch in a little cafe. The route continues up the bank alternating nasty industrial areas with pleasant marsh and river bank. We see several possible Collared Pratinicoles over a marsh lake. None of us has seen these before and look them up in Tony's electronic bird book. We may or may not be right. During a particularly unpleasant stretch of main road we stop for another beer, it is a quiet bar with two groups of old men playing cards. Betsy needs the facilities, it is unlocked especially for her. There were no surprises though this may have been its first use by a customer this year. The day closes when we arrive in Villa Franca de Xira tired after about 29km, not bad for a first day. Better night must be getting used to our travels even if we haven't started yet. Once more on to the trusty 714 bus and into town. We climb up many flights of steps though tiny passages. It would be easy to climb the wrong hill but having circled the castle we arrive back at the castle gate and stop for the worst cup of coffee ever sold us. The castle dates to the 13th century originally Moorish but recent excavations show remains of an Iron age fort. The views are impressive and Lisbon is a memory of orange roofs and white stone walls. The old castle walls are well maintained and laced with olive and pine trees. 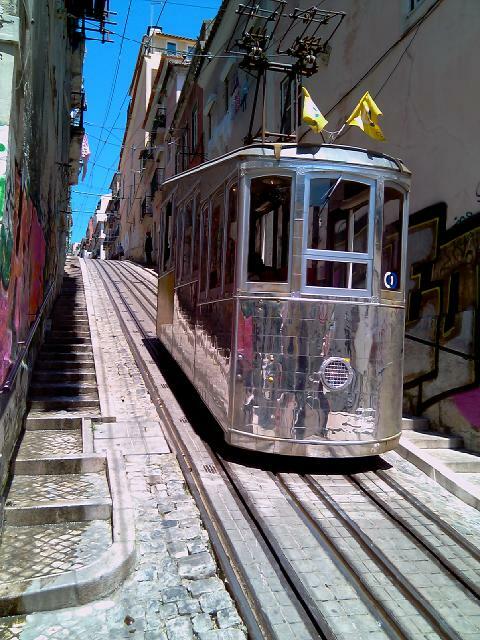 We now fulfill 2 remaining projects riding both the street trams that race up and down the steep cobbled streets, and a funicular down an even steeper cobbled descent. After lunch of some tapas in a little bar just off the funicular, we head for the tile museum. We spotted this on the first stage of the walk 2 days ago and it seemed interesting given some of the buildings around the town are covered with them. We found it quite easily in spite of the help of a friendly portugese who directed us off the bus 2 stops early. This did allow us to witness the alternate use of cobble stones, known to revolutionaries thoughout the ages, throwing them! We think he was a drunk denied access to the station not a real revolutionary. The tile museum was worth a visit in an old convent building containing not only religious tiled friezes but also secular wall coverings from the 16th century onwards. After which a walk back to the bus and back to the campsite to prepare for Jane's departure home and the start of the real walk tomorrow. Finally the team would like it known that none of the previous posts have been proof read and any errors of fact, logic, spelling, grammar or syntax are Tim's fault alone. Jane would like to you to know that she has now corrected the typos in previous posts (so much easier from the computer at home) and will continue to keep an eye on the posts. The style, however is Tim's alone! A cold night, Tims new very light sleepingbag barely adequate. Today we do Belem a part of Lisbon on the river Tagus from where Vasco da Garma sailed and much of the Portuguse colonial expansion set out. The achitectural style is Manuline after one of the kings of the time, responsible in part for the monastery of St Geronimos set up to pray for the royal dead. 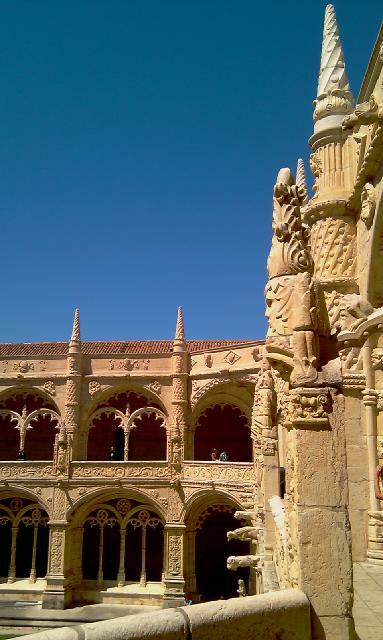 This is a World Heritage site and has more stone carving per square metre than anywhere we have seen as well as a marvellous double storied cloister marred only by the assembly in the courtyard of a scaffolding monstrosity we suspect for the forthcoming papal visit. Lunch is at one of many little restaurants along the main road just here. After a siesta in the park along with not a few locals, most seeming unconcerned about the state of their country's finances, we wander round the coach museum. This houses the national collection of royal coaches back to the 17th century. Including the one in which their king and crown prince were shot back in 1903. After this all else is an anticlimax so we head for the campsite by a convenient Decathlon store to get some gas for the brew stove in the morning. The one we found on the site has run out. We found the familiar yellow arrows painted on the walls in the old part of Lisbon. 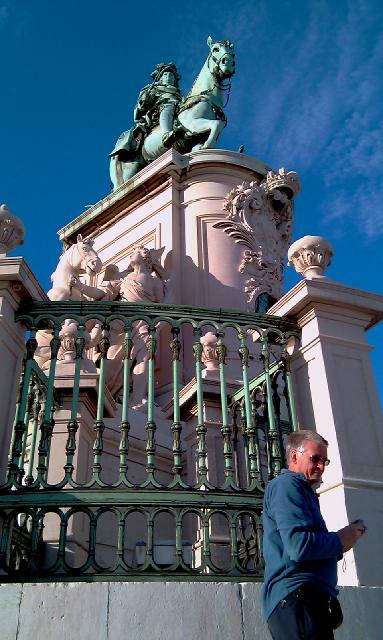 Also the 60 year old maps Tony found on the net are perfectly aligned, check for positiom by the side of a 200year old equestrian statue. They do like their heros on horseback here.